FlashTiming’s versatile FT-Display Mobile can be used anywhere and can be controlled by your smart phone! RACE CLOCK – Use with FlashTiming software to automatically start the clock. Add the photo beam to show unofficial winning time. Display a lap counter and sound the buzzer for the bell lap during distance races. 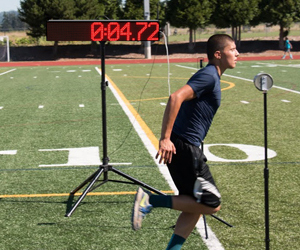 SPEED AND AGILITY TESTING – Add a touch pad and photo beam to time your 40 yard dash, 5-10-5 shuttle or other speed and agility drills, or test sprinters’ times out of the blocks. PERIOD CLOCK – Use in football, basketball, lacrosse, soccer, wrestling, volleyball or any other sport during practice to keep your workouts on schedule and cover all your drills. CROSS COUNTRY – Our unique XC feature allows you to simultaneously display the distance, current race time and projected finish time. INTERVAL TRAINING – Configure the clock for interval training and pace workouts with built in buzzer to keep your athletes on pace. 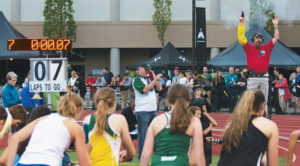 STOPWATCH or TIMER – Use it to time your athletes during workouts. Display Lap and Split times. RACE RESULTS – Send race entries and results from FlashTiming software. PERFORMANCE BOARD – Set up next to any field event and show athlete’s name and distance or height. TEXT DISPLAY – Use for general announcements and advertising. FT-Display Mobile is versatile and portable. Use it in the gym or on the field for any sport. FT-Display Mobile is easily controlled by your smart phone or FlashTiming radio.